In many situations it is desirable to allow users to register for access to information: giving some information about themselves, including their name and email address. In the above image you can see that a 'New Users Register here.' option is displayed. This will allow, for example, members of the public to access areas of a website providing they register first. In the above example the Access Codes dialog has been opened by right-clicking on the 'Registered Visitor' user-group (highlighted) to create an access code in order to allow members of the 'Visitor' (open access) to register on the website. If the access code is left blank then the system will allow access from the 'Visitor' to 'Registered Visitor' group on completing the registration dialog. 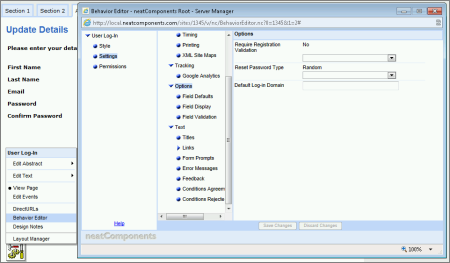 The Settings dialog, accessed from the Behavior Editor of the Log-in component allows for extended controls over the registration process, including requiring registration validation by email. See User Group Manager for further details on registration options and access control.